In this gripping and urgently prescient documentary, long-time TV director and producer Davis Guggenheim (“Alias”, “Deadwood”) eloquently weaves the facts of global warming with former United States Vice President Al Gore’s lifelong dedication to environmental causes. Skilfully combining footage of Gore’s rousing presentations with images of natural disasters - including Hurricane Katrina - alongside compelling computer graphics that demonstrate what will likely befall the planet in the immediate future, Guggenheim effectively communicates Gore’s potent message: disappearing coastlines will leave one hundred million people not only homeless but land-less. 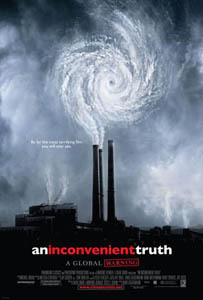 An Inconvenient Truth is required viewing for all.